Use a damp cloth with a mixture of mild detergent and warm water to remove dirt. Use a clean cloth to remove detergent residue. Do not spill liquids inside the vehicle. Electrical devices and systems may malfunction if liquids are splashed on them. Do not use silicone based sprays on electrical devices such as audio devices and switches. Doing so may cause the items to malfunction or a fire inside the vehicle. After using chemicals, make sure to gently wipe them off using a dry cloth. Let the belts air dry. 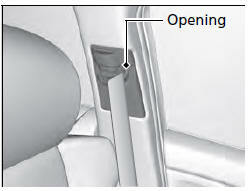 Wipe the openings of the seat belt anchors using a clean cloth. The front floor mats hook over the floor anchors, which keep the mats from sliding forward. 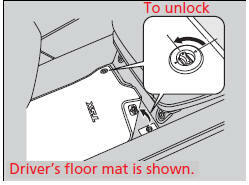 To remove a mat for cleaning, turn the anchor knobs to the unlock position. When reinstalling the mat after cleaning, turn the knobs to the lock position. Do not put additional floor mats on top of the anchored mats. If you use any floor mats that were not originally provided with your vehicle, make sure they are designed for your specific vehicle, fit correctly, and are securely anchored by the floor anchors. Position the rear seat floor mats properly. If they are not properly positioned, the floor mats can interfere with the front seat functions.